I ran across your blog in the hopes that you might be able to translate my tattoo. A buddy of mine has the exact same tattoo and he got me it as a gift for my birthday. Over the years I've questioned the authenticity of the meaning and turns out he has know idea what it translates to. 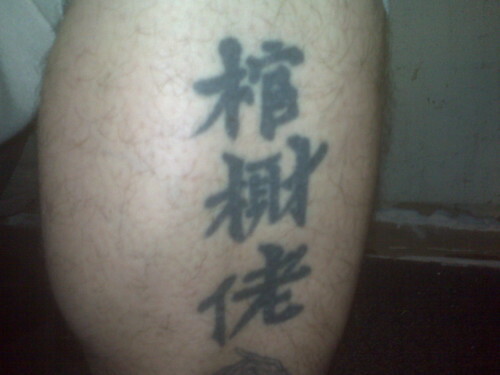 He told me it was kanji for "Fear No Man" , but I've looked in to it and know where can I find any similarities between what I have and what I have researched. I would appreciate your help in translating my tattoo so I could have some peace of mind. However, the middle character of 木見才 does not exist in Chinese character list.